I wanted a big whiteboard in my home office to be creative on, but then I thought, why limit it to a board, why not use an entire wall? The folks over at IdeaPaint made this possible. I now have a 4sqm whiteboard to dump all of my ideas on to! Some of my family live overseas and there are times when I am away with work. What better way to share the first months of our baby’s life with family then a webcam monitoring the cot? I chose the Y-Cam Black, an awesome IP camera (also supports WiFi) and InfraRed for night-time activity. 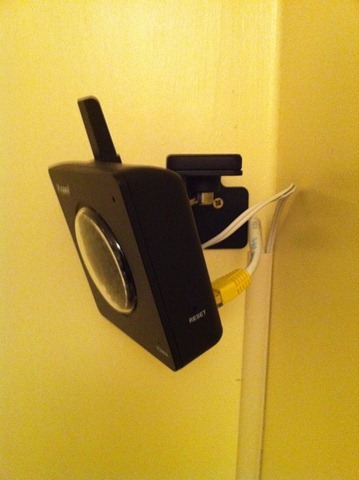 I’ve fixed it to the wall with a cable connection to the network. All you need to do is forward a port on your home router and the Y-Cam does the rest. Password protected of course. We just upgraded to Virgin 10MB broadband, so rather than lose more than half of it over at best poor WiFi, I decided to invest in Netgear’s 85MB PowerLine D-LAN solution. 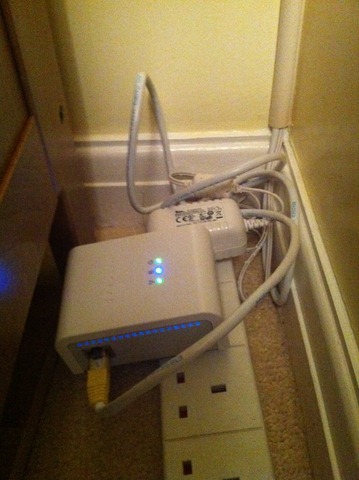 These handy little boxes plug into the mains and give you a decent wired network connection anywhere in the house. They also work across different ring mains and I have even got one in the garage for a future project. The home office was my little project, and I put some time into it as I’m now going to be spending a considerable amount of time each day sat in there. 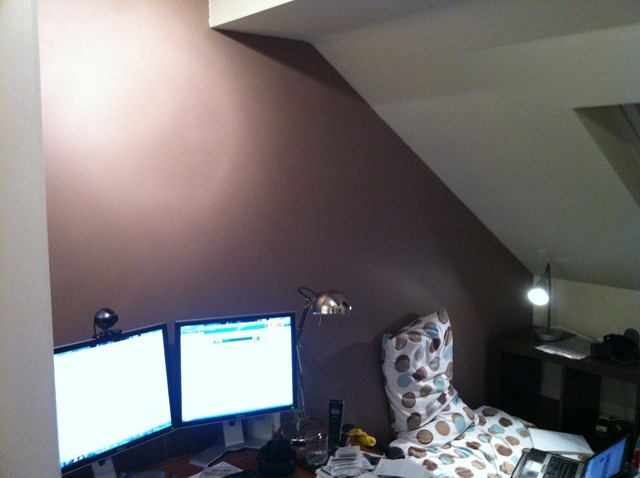 I repainted all of the walls and made a nice feature wall using Dulux Intense Truffle Feature Wall paint. I fitted a new Ikea light and lots of Ikea Billy storage. We got given a very nice futon which you can see in the photo – currently in use to get some sleep in-between the baby waking up! 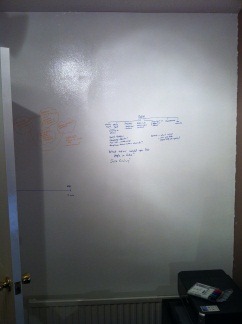 As mentioned before I have an awesome whiteboard wall and some subtle touches to give it a slick feel (e.g. the fancy low-profile black light switch). All-in-all we’re very pleased with our new place, and grateful to everyone who helped us get it ready in time! 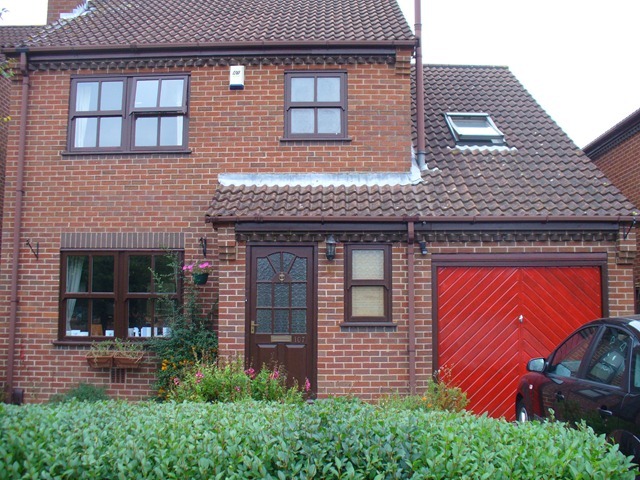 I love the top photo of the house. It screams “England” to me. (I’m in the US in Massachusetts.) I’ve got some English friends that live in a house that looks similar to yours, perhaps you’re neighbors in St. Albans, but more likely that style is just dotted all over the U.K.!!! Thanks, it is very much England! We’re about 2 hours drive from St Albans, but this was a popular building style about 20 years ago. The baby is a whole new (enjoyable) challenge!